I have read a book by Kevin J. Kennedy before. It's called Collected Halloween Horror Shorts: Trick 'r Treat. It was, indeed, a treat to read the book. The short stories were of great quality and I loved to read the book. 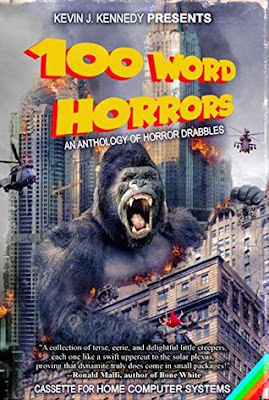 This book contains very short stories, only 100 words. It's hard for me to review this book the regular way, but in this blogpost I do want to tell you some things about this book, a book that you'd enjoy if you like the horror genre. I have pointed this out before, and I'm going to do it again; It's hard for me to get into books that have short stories. I can't totally "lose" myself in the story, because before you do it, the story is ended already. In this book the stories aren't even 1 Kindle page so you won't be able to get into the story, even if you were committing and trying your best. This doesn't mean that I can't enjoy this book. The books Kevin J. Kennedy writes with the help of other authors are always of great quality. I read the books with a lot of pleasure and I usually rush through, because the stories are great. What I liked especially about this book with the 100 Word Horrors, is that you read a short story and that the final sentence is the moment you "get it". Sometimes you have no idea what you're reading and the final sentence gives you that little information you still needed. It sometimes left me with a great smirk on my face. There were a lot of short stories that I would've loved to be longer stories! If you're a horror fan and feel like reading something very quick but with great quality, I would recommend this book! Do you read a lot of horror books? And what about short stories? I'd love to discuss books, so please let me know what you think about this book/review!